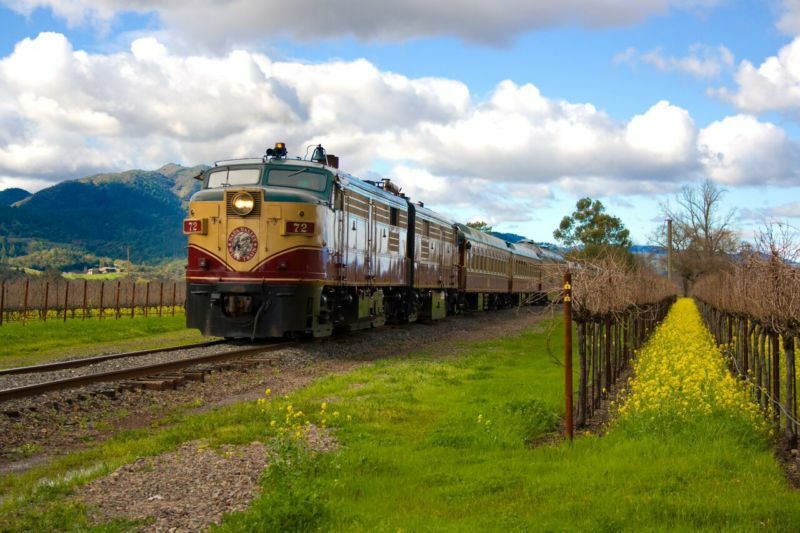 There have been many reviews of the Napa Valley Wine Train. We thought we would give you our take on this classic Napa food and wine adventure, as we recently took visiting friends. I love this experience. This is a well thought out, no hassles day. From the ample parking to the well-organized boarding and seating, nothing feels uncomfortable or stressed. Just show up on time and the friendly staff will take care of the rest. I would also like to give a shout out to the Customer Service Manager who accommodated our party after a communication mix-up. She was gracious and really kind. She won many points in my book for her great service. The Brit Comments: The one wrinkle in this well-organized routine is that a photographer tries to take a picture of each party as they approach the train. This step slows down the boarding, as people behind them need to wait in line. 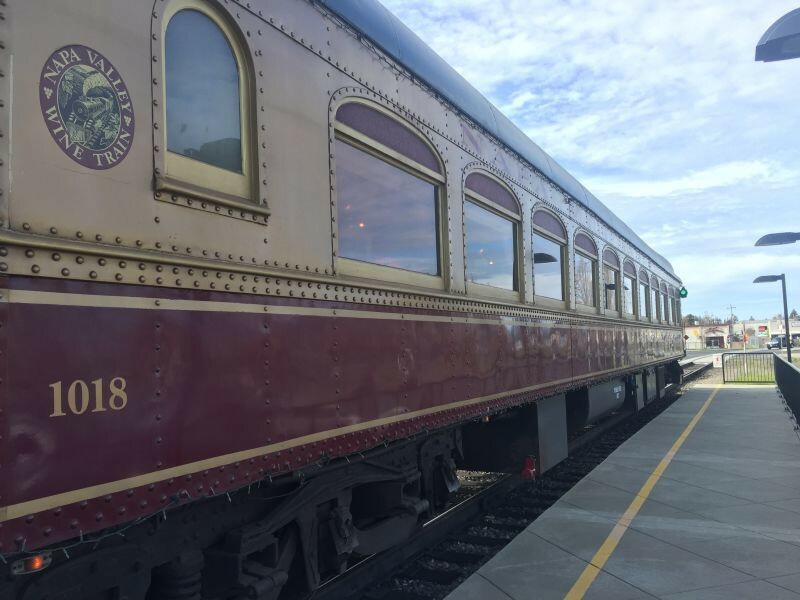 The trains are beautifully restored; think the Orient Express gently rolling through the Napa countryside. 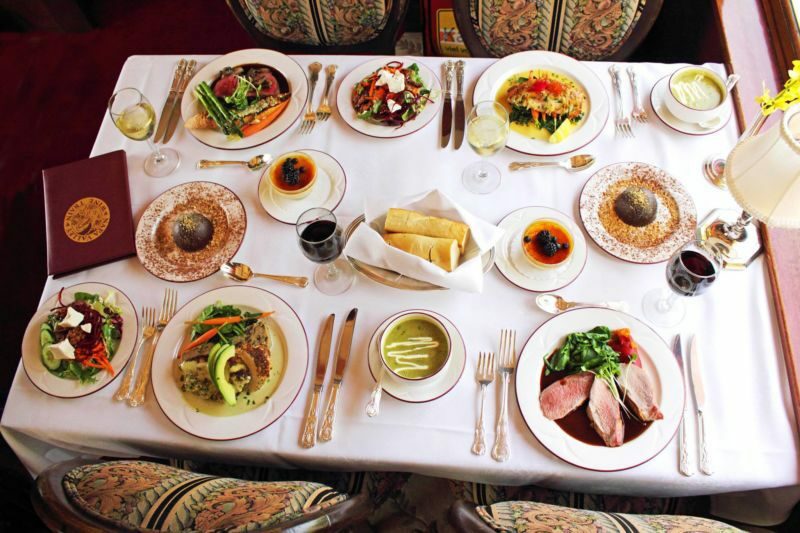 You have that old-time feel of elegant luxury. 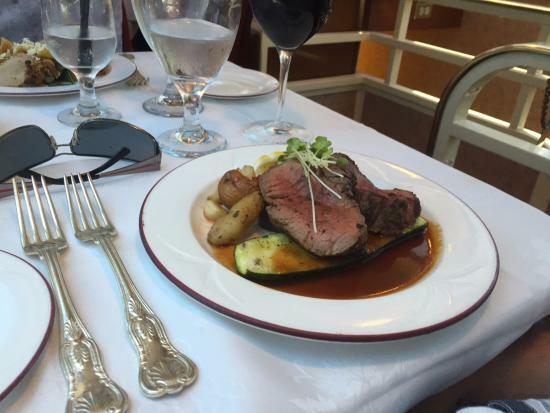 The round trip is only two and a half hours long, but your time is spent dining and enjoying the beauty. The Brit Comments: The train trundles along at speeds of about fifteen miles an hour. This may sound slow, but there are times that the traffic on Highway 29 is so heavy that you are passing cars. In any event, the purpose of the train is not to get to a destination, but enjoy the food, drink, service, and the scenery. Even though the road runs parallel to the tracks, the view from the carriages is markedly different from the experience you get in a car. 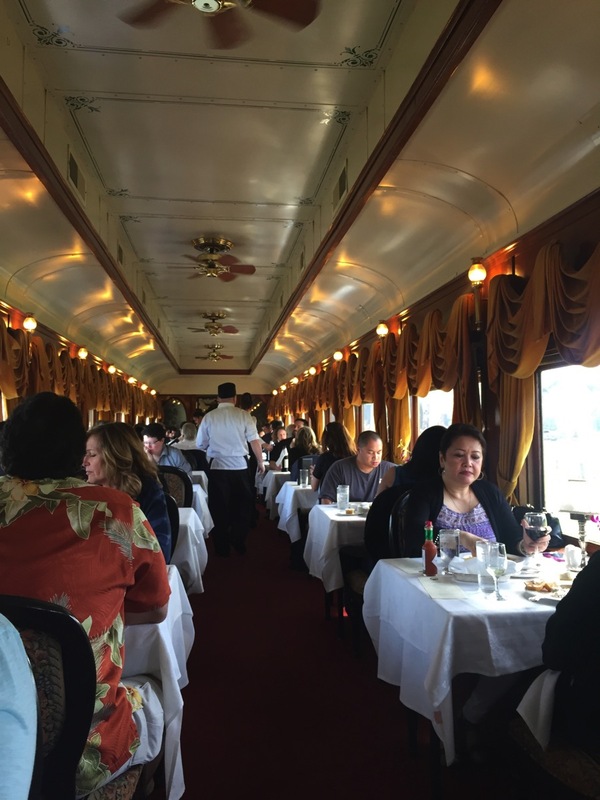 I have been very impressed both times I have visited the Napa Valley Wine Train with both the service and quality of the meals presented. As a funny note: I am glad none of you were there to see my face as I saw the food being delivered to the table next to us. They must have ordered the beef extra well done because what was served looked like dried shoe leather on a plate of brown gravy with wilted vegetables. I wanted to jump off of the train right there and then! Thank goodness that our food was cooked absolutely beautifully and didn’t even closely resemble what the other table was eating. Whew! Goats cheese salad with mixed greens, dried cranberries, pecans and a honey vinaigrette. Salmon with sweet potato in a Thai sauce. The beef was beautiful; from its presentation to its cook which was perfection. The plating was lovely. The veggies too were nicely cooked. There were sighs of delight for its gorgeous flavor. The Brit Comments: Our beef did not resemble the shoe leather delivered to the other table; ours was medium-rare, just as ordered. The salmon on my plate was cooked to order – medium rare. Many restaurants struggle to do this very simple thing. 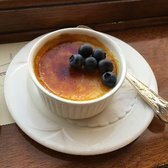 The crème brûlée was outstanding. Perfect brûlée on top, creamy inside, and beautiful real vanilla seeds at the bottom; what a joy to see. The flourless chocolate cake, topped with marmalade. The cake was amazing but the marmalade wasn’t the right way to go. Don’t be cheap. Create a proper sauce to go with it and it will be something that I will want even more than the Crème Brûlée. The Brit Comments: I beg to differ. I loved the marmalade on the chocolate cake. It provided an acidity and textural contrast to the heavenly cake. I had the feeling that the sauce on my Salmon had a Thai influence. It was on two rounds of sweet potato, with whole cloves of garlic. There were no other vegetables or grains. It was tasty, but I feel it would have been better with some jasmine rice or bok choy. The dressing on the salad was too sweet for the ingredients. I would have preferred something with a little more acidity. It wasn’t unpleasant or inedible. It was just a mouthful of sweet and even with the salty goat cheese, it was too much. I only had a sip of the Chardonnay they were serving. I needed to be the designated driver. Sorry, no review on the wine from me. What I tasted was fine; unmemorable to the point I don’t recall the name. The Brit Comments: I tried the Merlot, which shared the same lack of panache that California Girl identified with the Chardonnay. These were both house wines, or whatever the correct adjective is for wines served on a train. You can pay extra for wines and the list looked more interesting. There are also several flights on offer. So here are some insider tips for you: If you can, go in the week when it isn’t so busy. Always do the lunch ride unless it’s the height of summer, with the accompanying long evenings. The joy of doing the train is that you see the gorgeous Napa countryside. Why would you go at night and not be able to see the beauty? 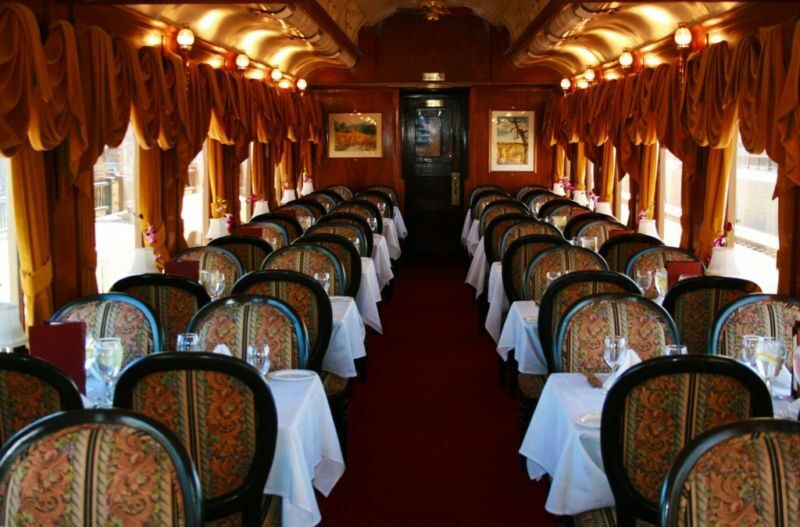 Ask when you are booking your lunch to be seated on the first seating for lunch and hopefully on the left side of the train from the direction you will be traveling. You will get the best views this way. Do get up and see the train after you have enjoyed your coffee and dessert. It’s truly beautiful and every car is different. 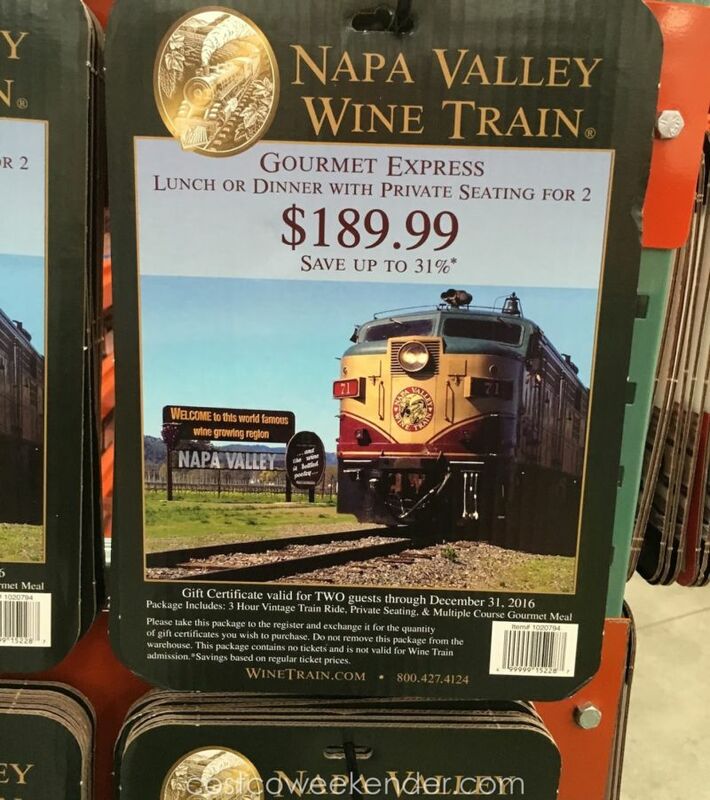 The local Costco in Napa, Vallejo, Fairfield, Rohnert Park, Novato, and Petaluma all carry discount tickets for the train. They only sell them though from October to March.